A mental marvel from birth, who used his talents on stage as a boy, Philip Strange is now known as “The Phantom Ace of G-2″ by the Allies during WWI. America’s enemies have assembled squadrons of flying furies, exploding skeletons, and invisible airplanes to turn the tide of the First World War. But when things get weird, we get Strange. 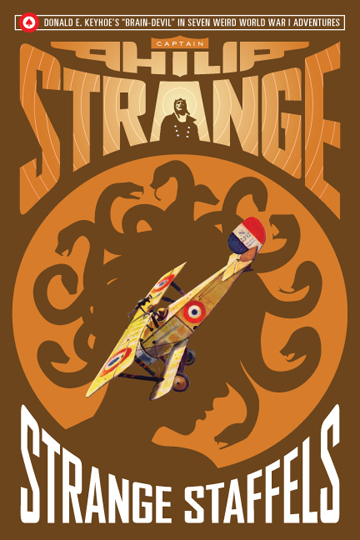 Captain Philip Strange, that is—ace pilot and so-called “Brain-Devil” of G-2 Intelligence. His assignment? Journey from the backalleys of Paris to the skies over Germany, taking down flying fortresses, cursed aerodromes, strafing skulls, and other wild weapons of mass destruction! Captain Philip Strange goes head-to-head with seven of Germany’s Strangest Staffels from the pages of Flying Aces magazine! Take another trip through the imaginings of Donald E. Keyhoe, where the WWI war skies are filled with giant bats, invisible fire, and beautiful spies. And where America turns to its own unnatural secret weapon: Captain Philip Strange. A mental marvel from birth, he was so terrifyingly effective as the Allies’ top agent that the Germans were offering a king’s ransom for his death. This fourth volume of weird WWI adventures collects seven stories featuring Germany’s wildest attempts to win the war and Captain Philip Strange’s counter measures!